PunchTown has assembled one of the finest pairs of 4 oz. gloves to ever hit the MMA market. The leather on these eX gloves is less flashy than PunchTown's TAT2 series, but it''s the same pre-softened cowhide leather. The strong leather surface is treated to be far more resistant to blood and sweat, and far less vulnerable to scratches and scuffs. Underneath this exceptionally pliable leather is a 3-layer padding system. The impact areas feature more dense protection while the outer-most layer provides a uniquely soft feel. The wrist is secured by the traditional leather strap as well as PunchTown''s "Boa-Tite" Independent Dual Strap, which results in a very simple and air-tight closure... Really a step-up from more complicated or bulky dual strap systems. Adding to the unique look of the KARPALs is the PunchTown logo, which is now printed into the leather strap instead of a sewn-on patch. To get the most accurate size, use this PunchTown PDF sizing guide. If you cannot view the PDF, use the below information. To determine correct size, measure around your hand with a string and then measure the string. Meausre at the lowest knuckles (the knuckles you punch with) of the 4 upper fingers (all the fingers except the thumb). If you'll be wearing with handwraps, measure with wraps on. Email your friend about the KARPAL eX mk II Professional White MMA Gloves. 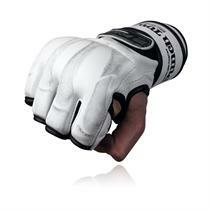 Ask a question about the KARPAL eX mk II Professional White MMA Gloves.